He Hammers A Bunch Of Nails Into A Lemon. The Reason Why Can Save Your Life. 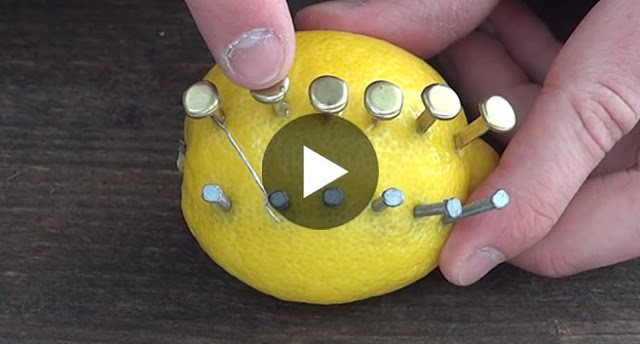 Home » SCIENCE-TECH » Videos » He Hammers A Bunch Of Nails Into A Lemon. The Reason Why Can Save Your Life. When you’re stuck out in the wilderness one of the first things you want to do is to start a fire, that’s pretty basic for survival. Now what happens if you’re stuck without any lighters or matches? Well did you know that you can produce a current high enough to start a fire using only a lemon, some nails and some wire? I’m not joking, and you’ll see for yourself in the video below – but knowing it could save your life one day. Possibly. If you remember to bring the lemons!